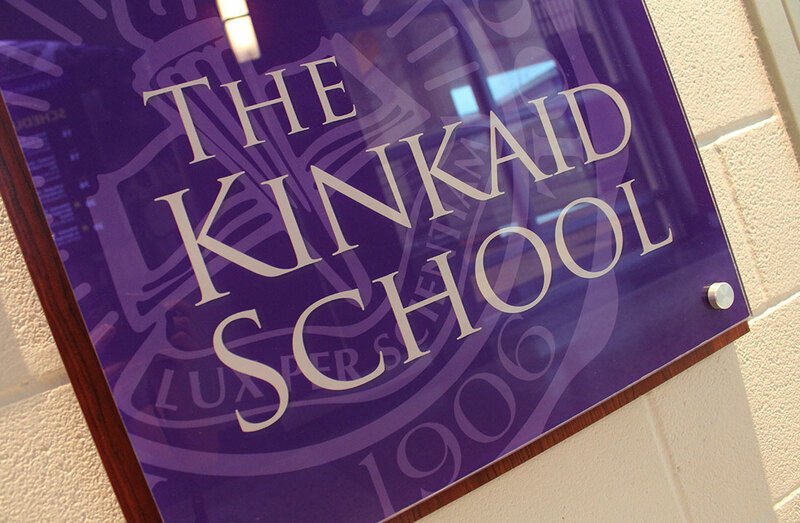 With a rich and storied tradition of rigorous academics, arts and athletics for all students, the Kinkaid School in Houston, Texas is one of the nation’s leading college preparatory day schools. Founded by Margaret Hunter Kinkaid in 1906, the school’s proud commitment to excellence is evidenced by its graduates and alumnae—global, community, creative and athletic leaders who have made a significant impact in our world. 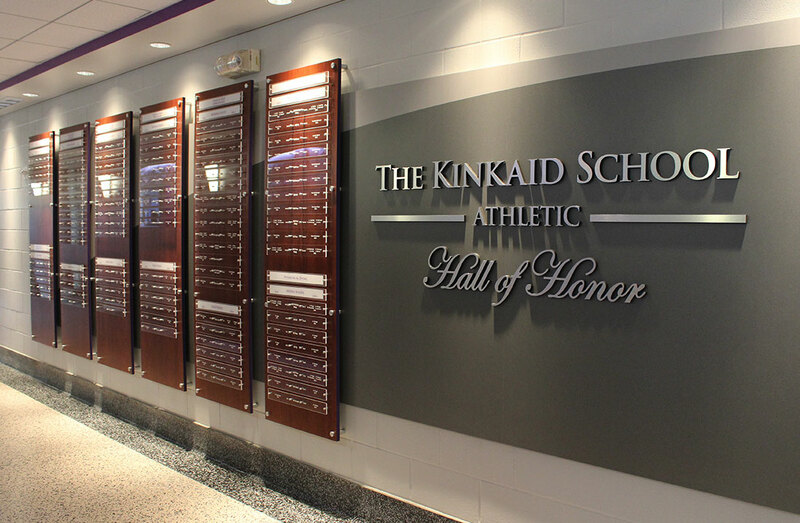 It is in this spirit that The Kinkaid School approached 2020 Exhibits to help them refresh one very important component of their athletic complex: the Wall of Honor. 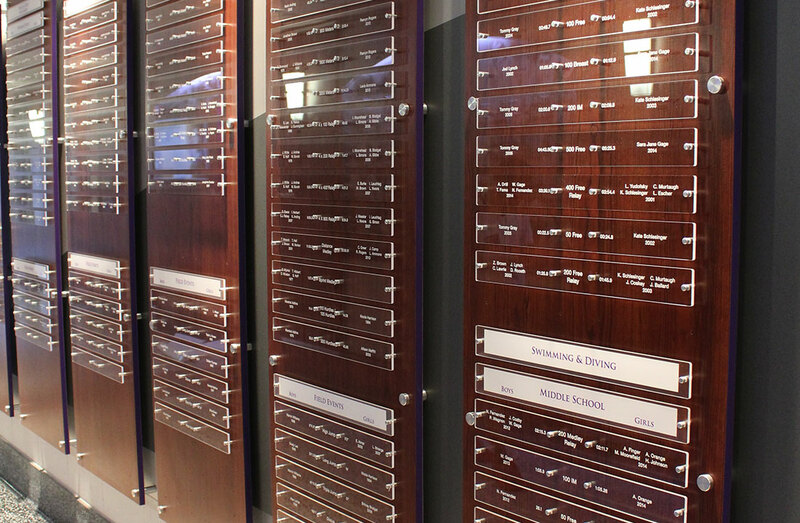 As a more traditional trophy case display honoring key student athletes, and teams, the Wall of Honor was limited in scope and in need of an update. 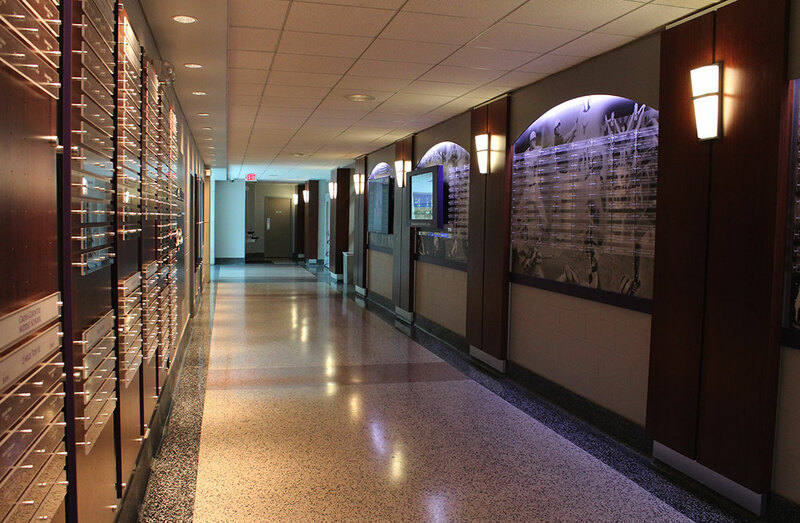 To make the space more dynamic and engaging, the 2020 Exhibits team worked collaboratively with the Kinkaid Athletic staff and administration to design and create a turn-key, immersive environment which included the design, fabrication, installation and delivery of a light, bright, polished and refreshing all-together new two-hallway environment, now known as the Hall of Honor. 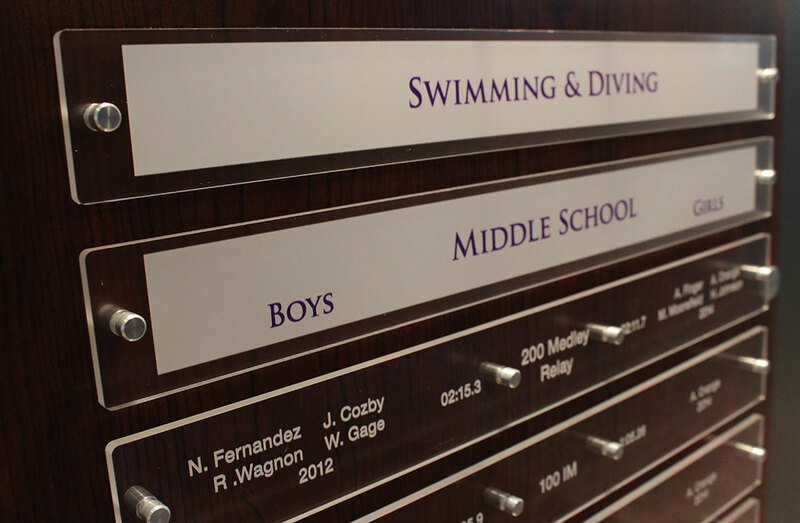 Located across from the Melcher Gymnasium in the heart of the Kinkaid School’s athletic complex, the Hall of Honor’s subtle yet thoughtful design elements showcase Falcon student athletes, while providing an engaging and interactive environment for those who walk these heralded halls. From entry to exit, the Hall of Honor is a celebration of sportsmanship and team work, recognizing the notable accomplishments of former Falcon student athletes and coaches. 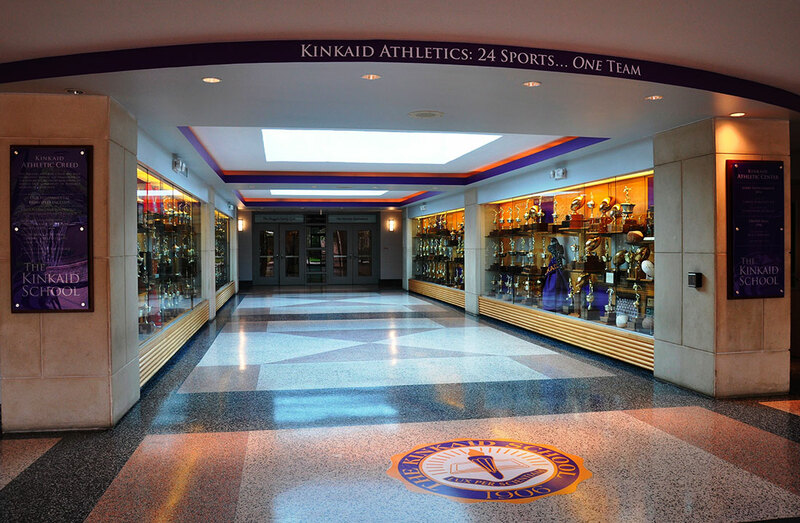 Recognizing Kinkaid student athletes participating in multiple sports during all four years of their Upper School career, the Hall of Honor gives visitors, current students, alumnae, family and friends a glimpse into the Falcon legacy. Visitors are met by the iconic Kinkaid Falcon, which is boldly printed as a frosted graphic on the glass entryway doors. Regal and royal ribbons of Kinkaid’s signature purple and gold line the halls with the school’s emblematic seal taking center stage. The school’s core values; Honesty, Responsibility, Respect and Kindness are also prominently displayed, nestled in purple and gold, serving as subtle yet important daily visual reminders. Thoughtfully echoing signature details, including curves and arches found throughout the campus, 2020 Exhibits creative design honors Kinkaid’s traditional architecture while infusing the space with more engagement and interactive, tech-friendly touches. 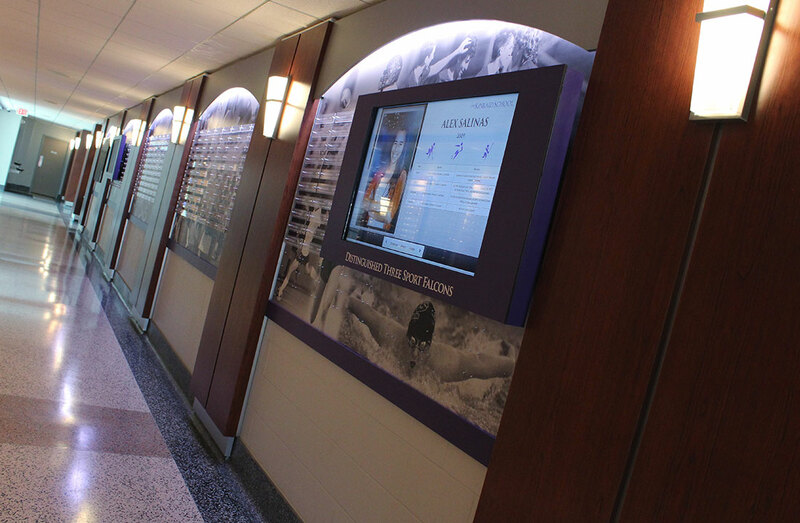 A dynamic touch screen presentation is featured, showcasing more than 200 Kinkaid student athletes, whose images and athletic histories are searchable by name, year and sport(s) of choice. 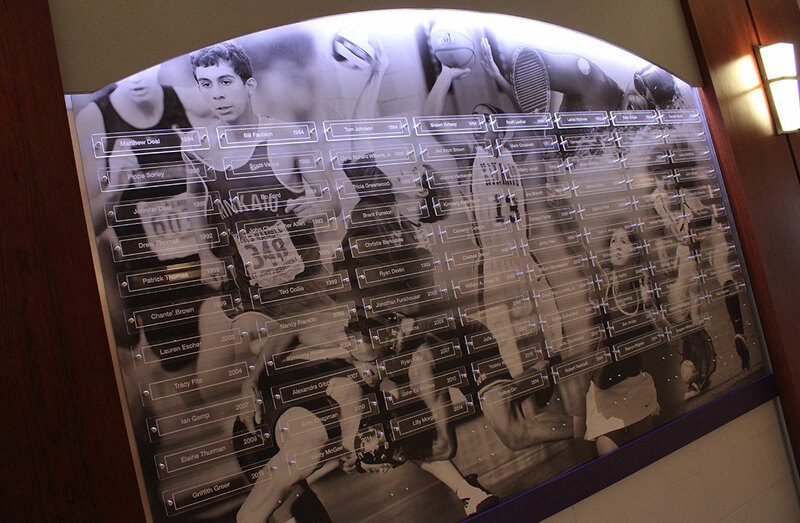 With a robust library of archival photos from which to choose, 2020 Exhibits took great care to focus on the many sports found at Kinkaid to design and custom print large photo murals, featuring student athletes and teams in action. Individual student athletes are recognized, noting their sports and years of participation. From wall sconces to brushed metal and soft wood tones, the materials selection embraces the quality, spirit and intent of the Hall of Honor. The end result is an open, inviting and contemporary space that celebrates and honors Kinkaid’s student athletes, teams and retired coaching staff. From entry to exit, the Hall of Honor is awash in Falcon spirit and style, serving as a reminder and reinforcement of Kinkaid’s measure of excellence that will serve as an inspiration and celebration for years to come. Go Falcons!